The day had come for our first sail, but it was not going to be a long one as I was not sure what the kids and Joan would be like and I looked a little bit naughty out there too. So first things first and that was to have a good hearty breakfast before we set off. You cant go to sea on an empty stomach as if anyone were to be sick then they had something to bring up. Once we were all feed we had to go through the check list of things to do before we sail and it goes a little something this…..
1. Checked that all the windows were shut as the last thing we want is for a wave to come in and soak everything with seawater. 2. Anything that can fall of the sides, shelves etc, must be secured down or put onto on floor so it does not get broken or break anything else. 3. Engine has to be checked to see water levels and oil levels are okay. 4. Once the engine checks are done, we start the engine and give the it visual check to make sure nothing is wrong. 5. Plan a route on the chart to make sure we get there safe and sound. 6. You are not allowed outside the cockpit when we are sailing as I don’t want anyone falling over. After all the jobs were done we started the engine, pulled up the anchor and off we went, out into the open waters. The look on their faces was a treat as some were smiling from ear to ear, another was nervous and the other did not give a monkeys…. Its funny how people differ from one to another. Once we were out it started to turn a bit rough but we only had this for an hour until we got around the corner into settled waters. We did not sail on this occasion, but our time will come for that, and in the mean time we were just going the steam to our next destination which was only 2 hours away. The seas were not the best but everyone seemed to enjoy the trip and as you look at land from a different angle the time seems to fly by and before you know it we had arrived in St George’s. We slowly steamed closer to where I wanted to be and Joan go the anchor ready to drop. This was the first time for Joan to anchor and she was a little bit nervous which was expected, but she did a great job and the anchor dug in straight away. I jumped into the water and dived down to check that it was ok. It was dug in perfect so we had no worries about leaving the boat, so off we went to have some lunch and then to buy so food to last the next 3 weeks. After we had stocked up the fridge and freezer we decided to go for a snorkel. I had heard about this little place to go snorkelling which was supposed to be really good and it was not far away so we started the dingy and set off. Once we arrived, tied the dingy off, put our masks, snorkel and fins on we ready to explore and all I can say was that it was amazing, so much so that we went again the following day. We had to watch Archie bit as he had never been snorkelling and he was not the best swimmer but after an hour or so he was doing absolutely amazing and before you know it he was diving all the way down to the bottom and loving every minute of it too. 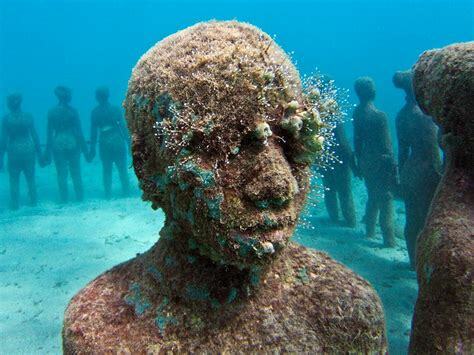 I was desperate to see everyone’s face as I had not told them about the underwater sculptors that had been placed there on purpose by a British man called Jason Taylor. 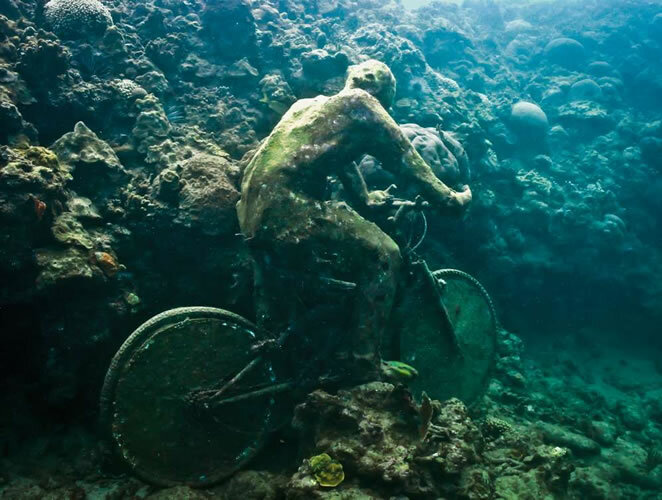 I only told them it was fish and coral but their excitement when they first spotted a man on a bicycle at the bottom of the seabed was so much fun. I told them they had to spot as many things as possible and later they had to draw and write about what they had seen. 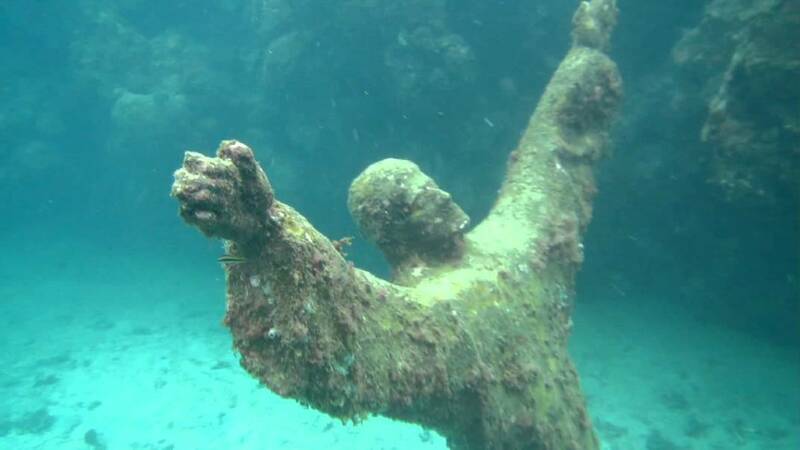 The only thing that I did not like about the sculptures was that I wished I had seen them when they were first placed on the bottom as it would have been amazing to see. Lots of them were broken or had moved during a storm which was such a pity but I still really enjoyed it. 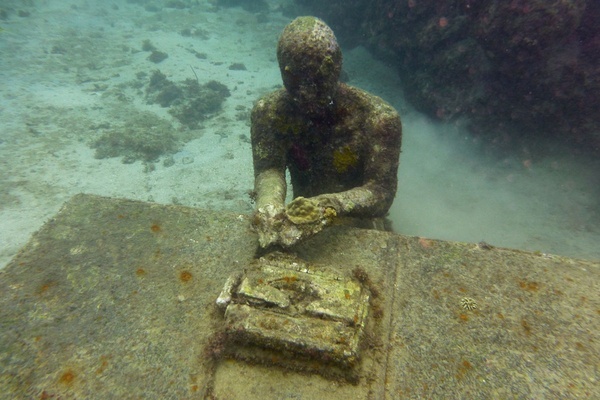 I later found out it was the worlds first underwater sculpture park and it was Taylors aim to engage local and non local people with the underwater environment that surrounds them using his works about life around them so installed concrete figures onto the seabed. Some of them were amazing and showed life how it was. So if you ever in Grenada go and have a look at this place as its well worth it. If this was the start of things to come then I was really going to enjoy this trip and so was everyone else.